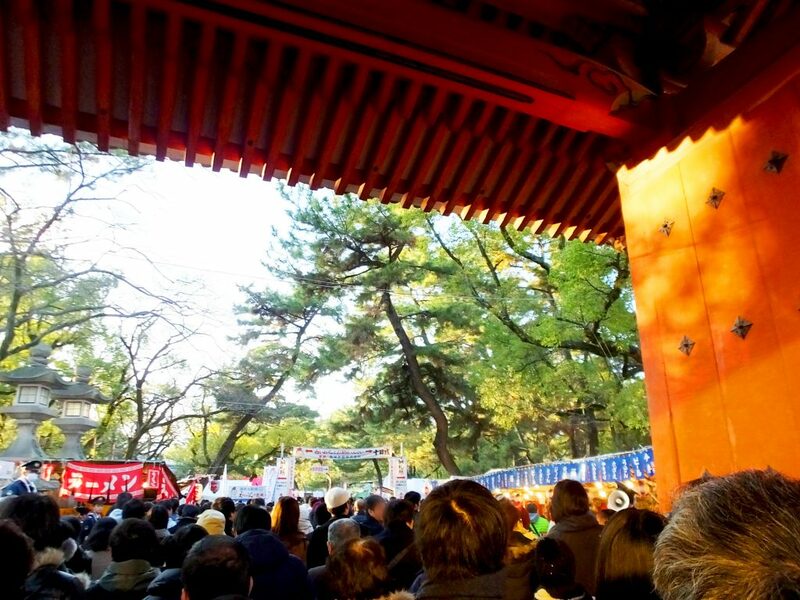 Every year, a big festival is held at Nishinomiya Shrine from January 9th to 11th. 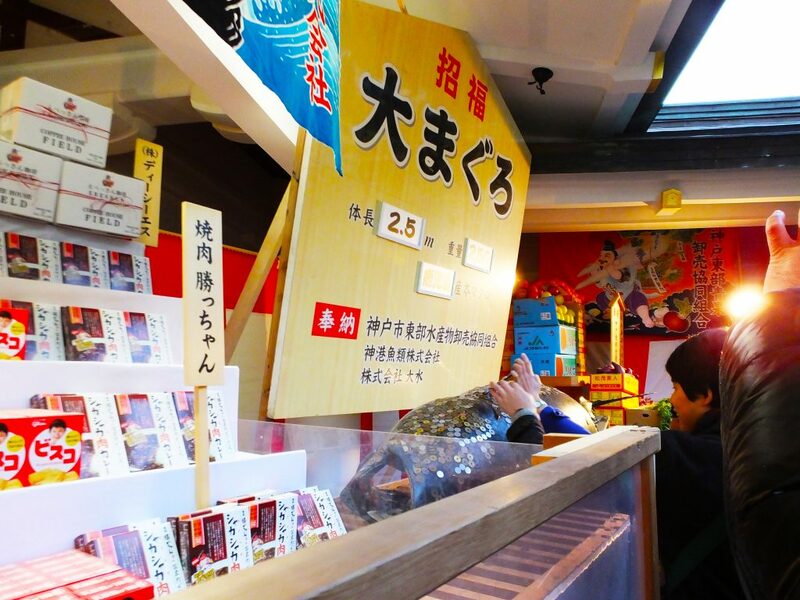 More than 1 million visitors flock to the shrine and pray for thriving business. 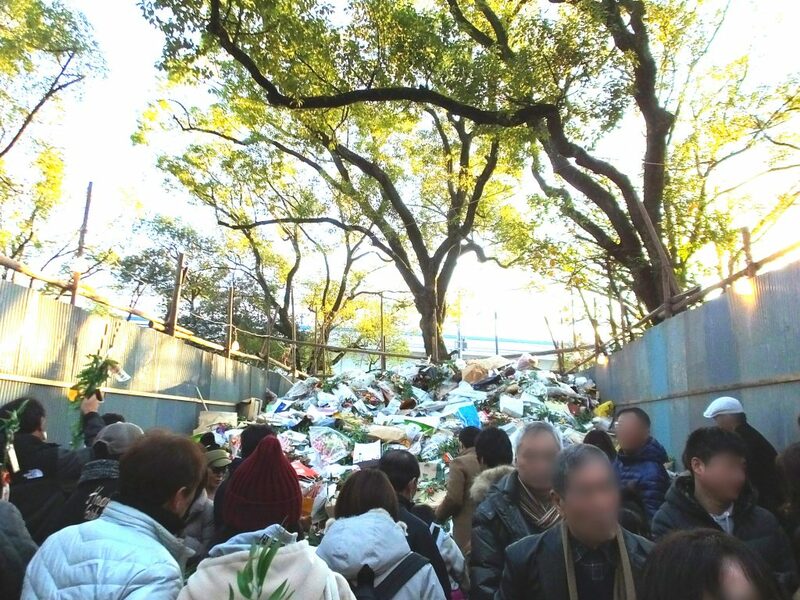 The festival is called “Toka Ebisu” or “Ebessan.” “Toka” means “10th”, and the main day is January 10th. I went to “Toka Ebisu” this year (2016). 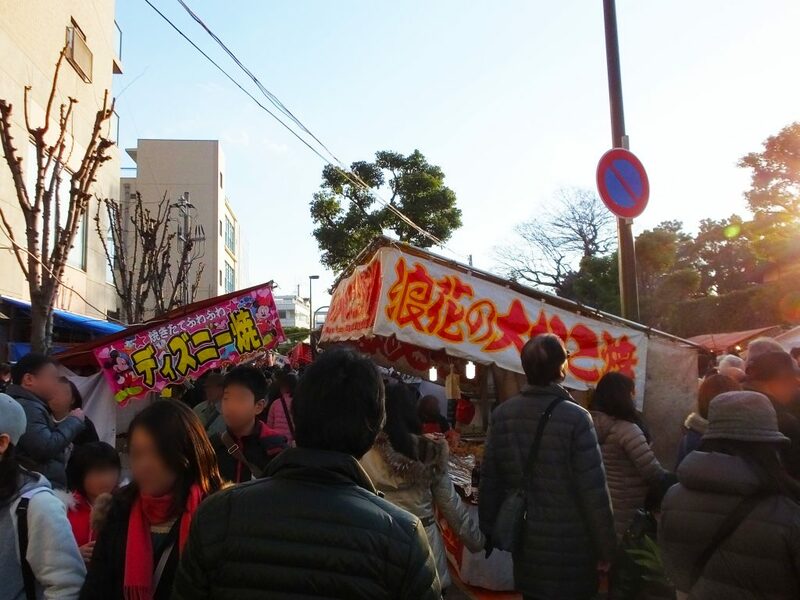 There were many food stalls around the shrine. The street was so crowded that road traffic was controlled. 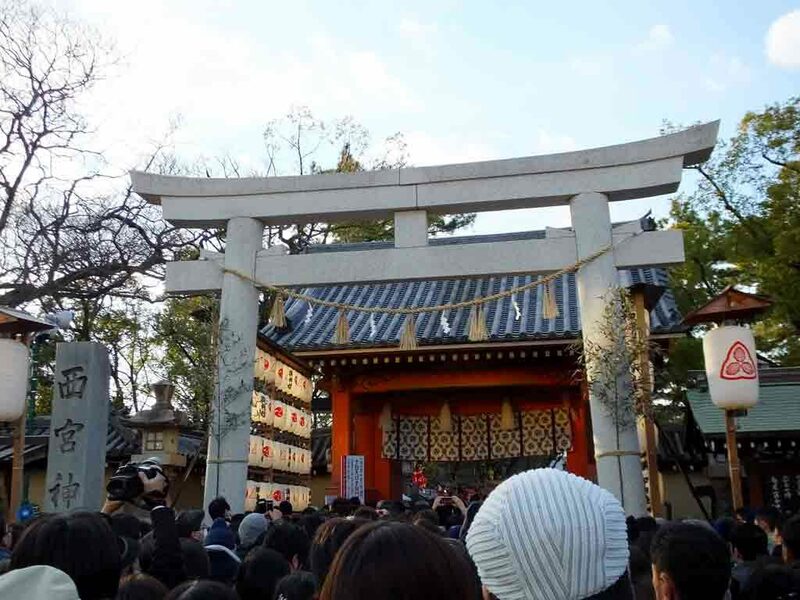 I couldn’t make my way to the shrine and was waiting in the crowd for a long time. I heard an announcement saying “No pushing! Don’t rush! It’s so dangerous!”　You can see a torii, a traditional gate of a Japanese Shinto shrine. At last, I could enter the shrine. 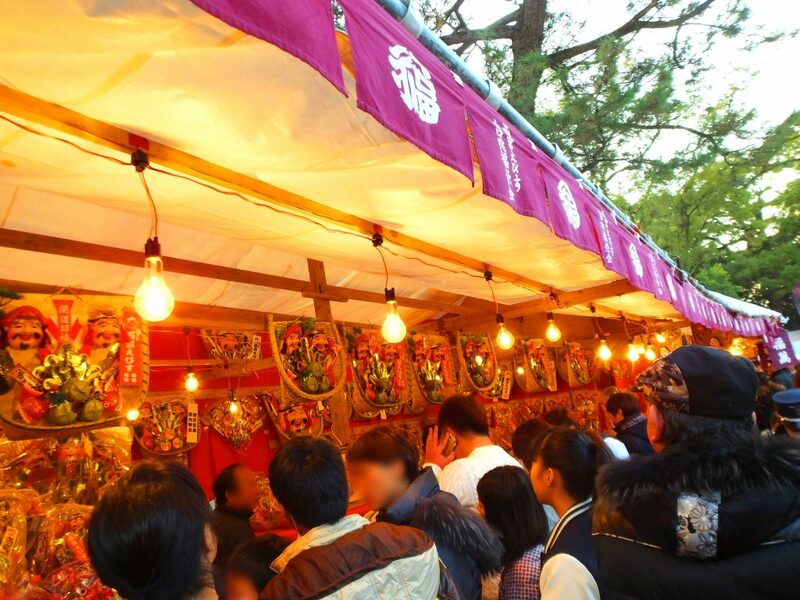 There were food stalls in the shrine, too. Can you guess what kind of scene this is? As well as the bamboo branches, they sell bamboo rakes and bamboo winnowing baskets. 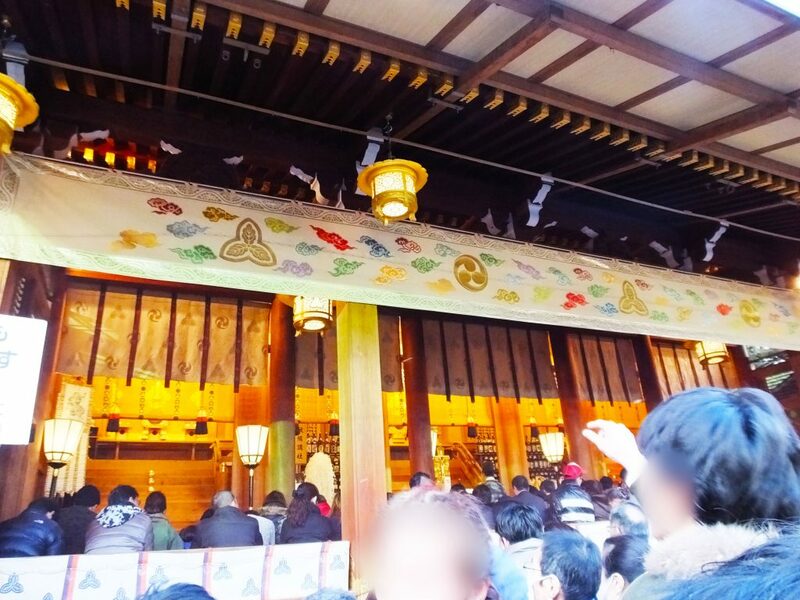 This building is a haiden where people worship. Can you see fluffy white stuff above visitors’ heads? Before entering the haiden, it’s shaken above your head. 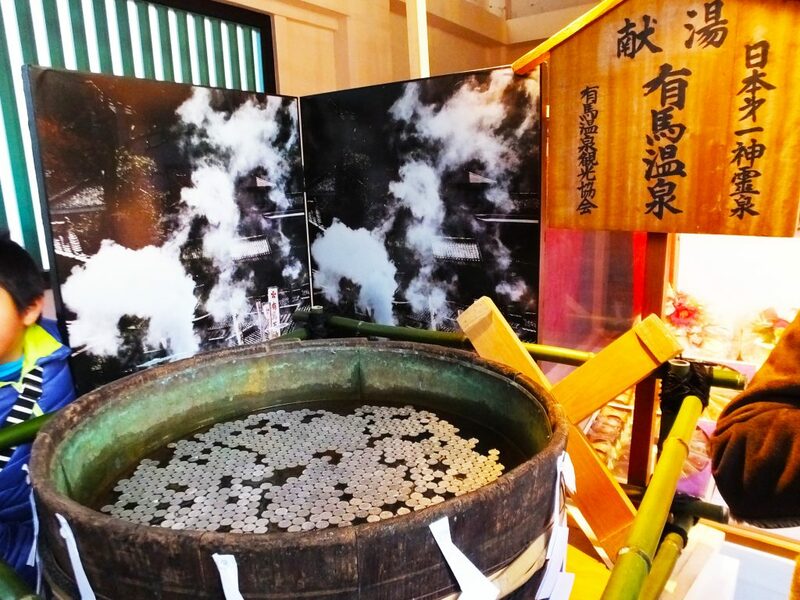 It’s a kind of Japanese purification called oharai. 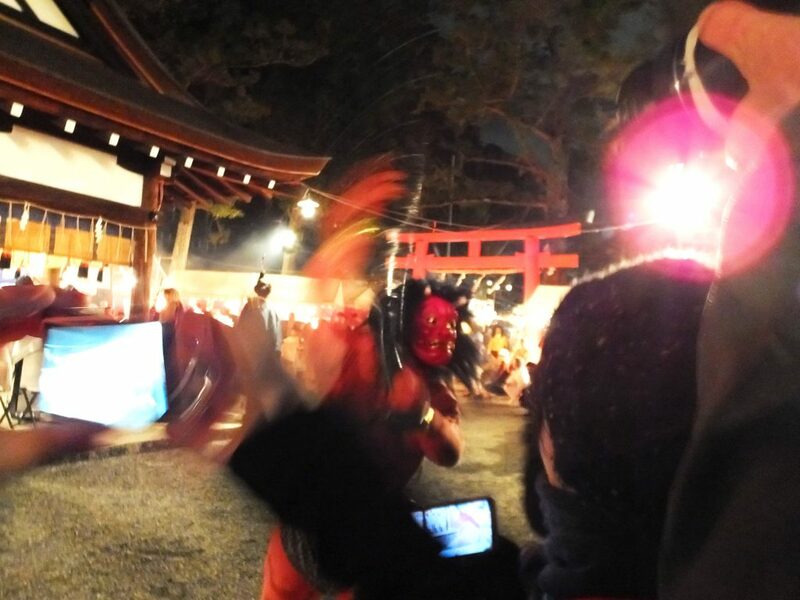 It was the first time for me to undergo oharai in front of a haiden. There was an offertory box, so I put a 10-yen coin in it, and lowered my head slightly to undergo oharai. This is put in front of the haiden. Can you guess what it is? 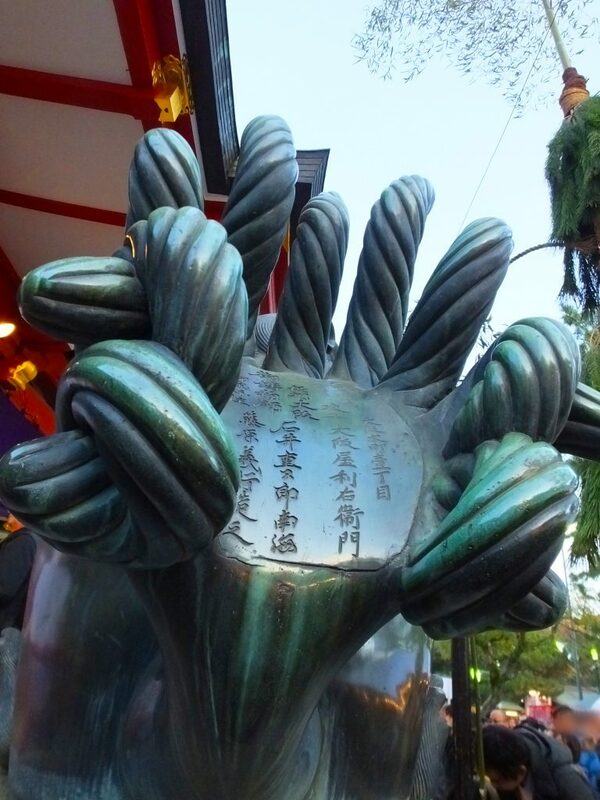 It’s a tail of a komainu, a statue of an imaginary creature. You can see a komainu in the bottom of the next picture. You can see the rare decoration with pine branches, too. I learnt that it’s called sakasa-kadomatsu. Sakasa means “upside-down”. A kadomatsu is a Japanese New Year decoration. 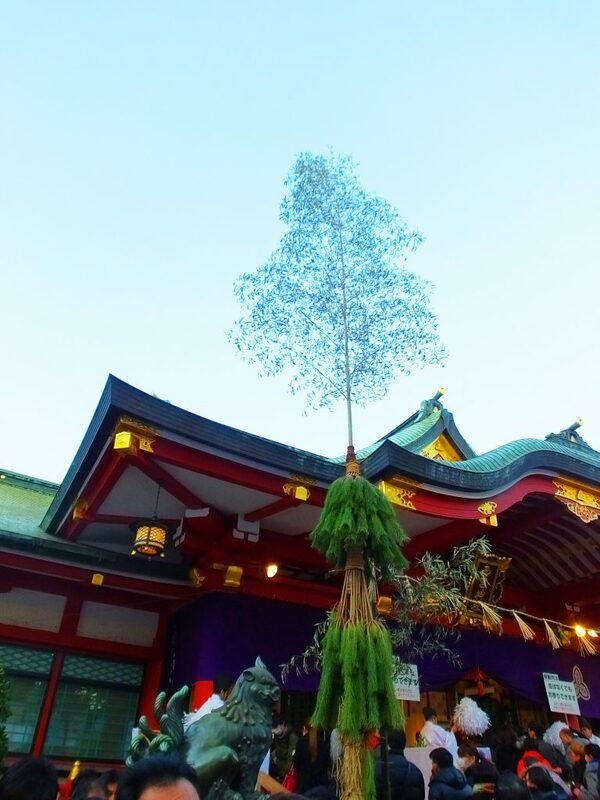 In Japan, matsu or pines are lucky plants. “Toka Ebisu” is famous for two things. One is an omaguro or a big tuna. The other is afukuotoko or a lucky man. 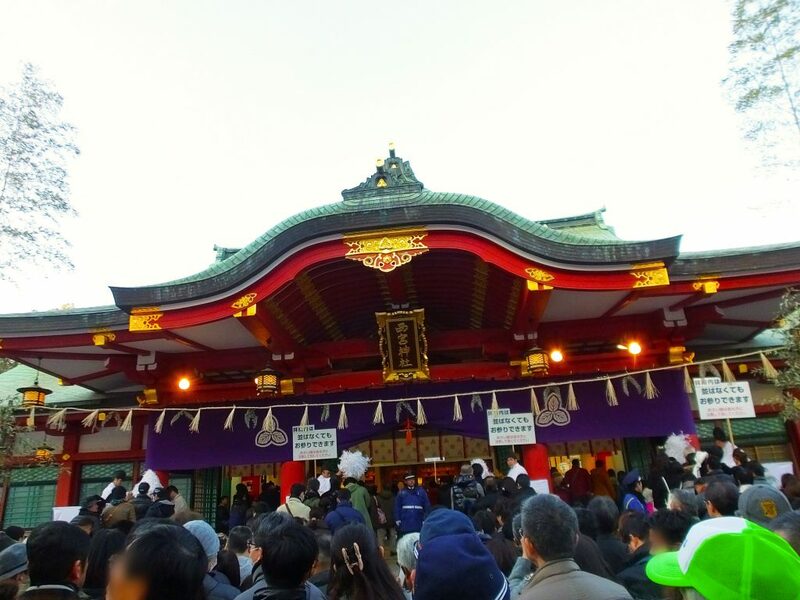 At 9:30 a.m. on January 8th, a big tuna is dedicated to Ebisu-sama, the god of Nishinomiya Shrine. The tuna is put in the haiden for 3 days of “Toka Ebisu.” On the board, there is explanation of the big tuna. 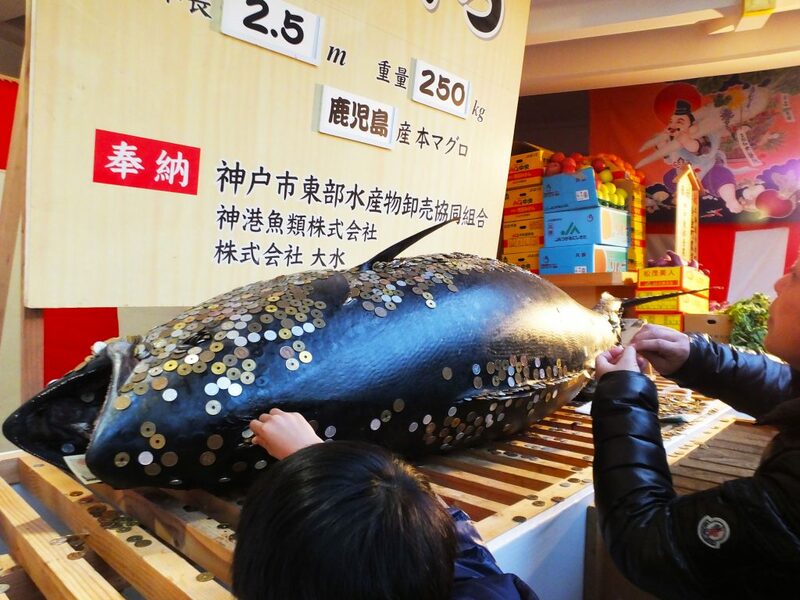 Try to stick a coin on the tuna, praying for thriving business! If your coin wouldn’t fall down, you’ll have good luck. (If you want to try it, get in the left line in front of the haiden.) I tried it for the first time, and I successfully stuck my coin. Lucky me! There were such vegetables next to the tuna. As to the fukuotoko, there is an important race on January 10th. 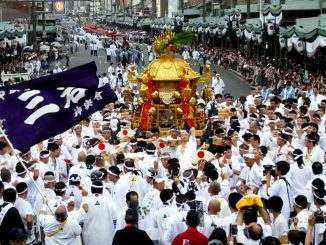 When the gate of the Shrine opens at 6:00 a.m, many men break into a run toward the honden, the main building of the shrine. The top three finishers are given the title of fukuotoko. I hear women can join the race, too. I watched the race on TV. It was thrilling! The haiden is beautiful and solemn. I looked back, and found a tub. What’s in it? On the board, there is explanation: hot water from Arima Hot Springs. It’s one of very famous Japanese hot springs. 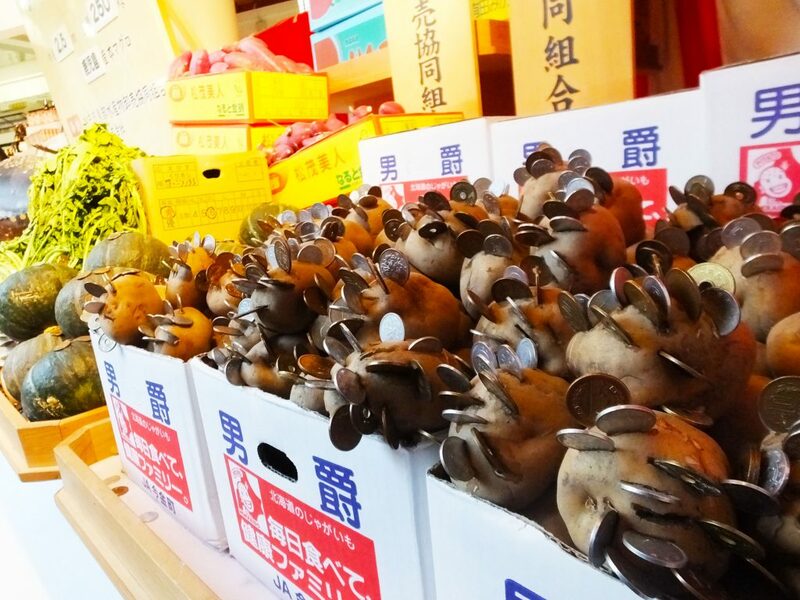 People tried to float 1-yen coins on the hot water, praying for thriving business. If you can, you’ll have good luck. 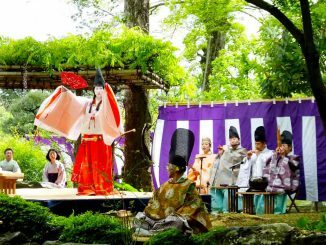 I went to “Toka Ebisu” and I learnt there are various ways to enjoy the festival. 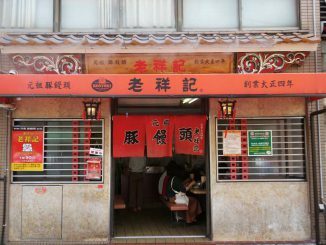 When I was young, I was looking forward to buying food at food stalls. Now I want to know about the shrine and festival more. There’s fun for everyone from children to the elderly!